Gifford Pinchot National Forest and local partners are hosting three free fishing events for kids and families. The closest event is at Merwin Park from 9 a.m. to 1 p.m. on Saturday, June 6: the Mount St. Helens Kids’ Fishing Derby, where 1,500 rainbow trout are waiting to be reeled in by kids. There are two more free kids’ fishing events, but you’ll have to drive a little further: the Mt. Adams Fish Education Day at Goose Lake, deep in the forest north of Carson, from 10 a.m. to 2 p.m. on Saturday, June 13 (call 509-395-3419 for details), and the Lewis County Kids’ Fishing Derby at Lake Scanewa, east of Chehalis, from 9 a.m. to 1 p.m. on Saturday, June 6 (call 360-740-2449 for details). The Inn at Crippen Creek Farm — in my favorite town of Skamokawa — is offering a Beginning Artisan Bread Baking class on April 12, starting at 11 a.m. Folks will learn to make a master dough for focaccia, pizza and baguettes. The cost is $50 per person and includes pizza for lunch. I’ve had Don and Kitty’s pizza — believe me, this alone is worth the price. Other classes are available too. Check out the schedule and registration info. Participants are sure to get a rise out of this experience. Heh heh. I’m feeling it again, the love for a little town called Skamokawa in Wahkiakum County that I wrote about for the last issue of North Bank. Courtesy of Don and Kitty Speranza of the Inn at Crippen Creek Farm, I just came across a great blog that’s been around for quite a while, called Skamokacentric. The postings are few and far between but the community links feature local musicians, artisans, bakers, B&Bs, eateries and on and on — all the great stuff that drew me out that way to begin with. Can’t wait to go back. The photo above, taken by Kathleen, the blogmaster of Skamokacentric, is from an art exhibit going on right now at Redmen Hall. 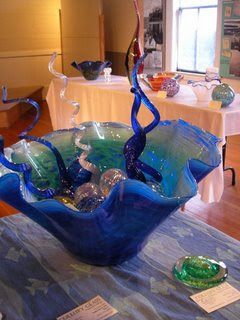 Skamokawa glassblowers Kyle Gribskov and Treasure Collupy will exhibit their work during through next month. The exhibit is open Thursdays through Sundays, in the afternoons. It’s so beautiful in Wahkiakum, you could drive off the road staring out the window. Just after the floods swept through southwestern Washington, I headed to Wahkiakum to research a story for the excursion section of the next North Bank magazine. I had been calling for a couple of days; the lines were cut off. Folks in the county could only call each other and no one could call in or out. I got through to a few of the B&B’s I wanted to visit only by email. I got my first taste of eastern Wahkiakum hospitality in this response from Don and Kitty Speranza, Portland expats who built The Inn at Crippen Creek Farm outside of Skamokawa. I had asked her if shops would be open after the chaos of the week before and Kitty, of course, offered to check for me. Here’s a snippet. So lovely. “I do think that most of the shops will be open. I would be happy to check for you on that. I could make a few calls. Let me know if you would like for me to do that. There are not a lot of shops but I do not think you would be disappointed to visit our area. It is a wonderful place, off the beaten track. This was a little bit how my whole day in the county went. Folks would recommend I get over to some place or another and then just pick up the phone to check on open hours for me. Rob at Stockhouse’s farm got on the horn with the River Rat Tap and I ended up having a very satisfying plate of fish and chips there; and Kitty and Don sent me over to Trillium Books. Seemed like the day moved at a pace determined by Wahkiakum itself, and folks all had some kind of unspoken agreement on what’s what. Rob and Diane’s Puget Island farm and guest cottage seemed to be where all roads led, and my favorite thing happened right in their living room. Earlier that day, Tanja over at the chamber insisted I chat with Richard Erickson, the EDC director, even though I really wasn’t prepared for a formal interview. Well, Richard turned out to have all this great perspective. We had a short, informative chat, and went about our days. Several hours later, I find myself lingering in Rob and Diane’s living room over a cup of tea, when a car drives onto their property. The dog starts barking and Rob pops outside. Turns out, it’s Richard, showing around the area’s new prospective physician, and the Stockhouse’s farm just happened to be on the tour. We greeted each other with a laugh, and I somehow felt like he knew I was going to be there. They broke out a bottle of wine, and I headed to the Rat Tap. So what I hear is that folks don’t like long blog entries so I will put a period on it. More soon, and more on North Bank itself. Stay tuned and watch for the magazine Feb. 22 with all sorts of Wahkiakum goodness.